2 How long to cook potatoes? 3 How to cook potatoes in multivarka? 4 How to cook a potato in the microwave? Potatoes - one of the most popular products on every table. In Russia, this vegetable have started to grow only in the XVIII century, but since then it has gained enormous popularity. Potatoes are very useful and contains a lot of vitamins and nutrients. Cook some food from it is not so difficult, However, there are some nuances and in the, how to boil potatoes. 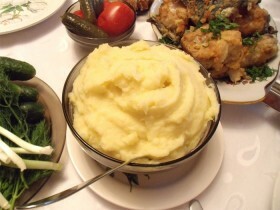 One of the most popular and simple dishes of mashed potatoes is. For his preparation can take any size tubers. Potatoes should be cleaned, folding each tuber purified in a container with cold water. The tubers are washed several times, water is discharged. Next, each fruit cut into pieces and everything goes into a pot of cold water. Volume of the liquid in this case must be such, to the potato was completely hidden under water. Pan covered with a lid and put on fire. After boiling the fire slightly decreases, Potato cooking continues until it is ready. You can check this, try through the set time slice to taste. Check for hardness with a knife or toothpick is not recommended. Similarly, you can not set the cooking time, tk. it depends on the size of pieces of tuber, water volume, and other factors. During cooking, you need a little salt the water. Jacket potatoes - a perfect dish if, when there is absolutely no time to clean, tubers are very small, or simply did not manage to solve, how to cook potatoes is today. It is best suitable potatoes: they should be placed in the prepared container and pour cold water, to the tubers were completely hidden beneath. salted water (a teaspoon per gallon of water). After that, as the liquid comes to a boil, We need to reduce the heat almost to a minimum, to give the potatoes how to boil. When cooking on high heat middle can remain raw. To test the willingness need a knife or a stick. Better get "checking" it is up to the middle of the tuber. Potatoes, cooked in their skins, It can be eaten with the skin. Many people use this method of cooking vegetables for subsequent cooking salad. To peel easily separated, More hot potato kept in pure cold water for two minutes. 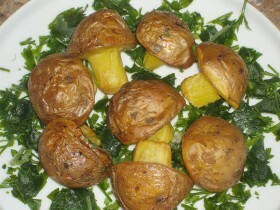 Potatoes cooked in their skins 25 minutes, cleared – 20 minutes, in a microwave oven - in the middle 16 minutes. 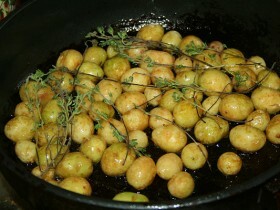 However, there are special varieties of potatoes, which need to cook all 5 minutes after boiling water. How to cook potatoes in multivarka? For any double boiler or multivarka usually comes with instruction, in which there are recipes for the preparation of various dishes. But in a nutshell the whole process is as follows:: Multivarki poured into the tank two cup cold water, there is put peeled and sliced ​​potatoes. Brewed with the lid closed order 15 minutes, however, the time again, the approximate. How to cook a potato in the microwave? Quickly and easily you can cook potatoes in a microwave oven. To do this, taken usual dish, which laid out the vegetables. it's desirable, before cooking potatoes, poke it with a toothpick or knife. This will help her to the core propechsya. Thereafter, the furnace is closed, potatoes boil for 10-18 minutes, depending on the selected mode.